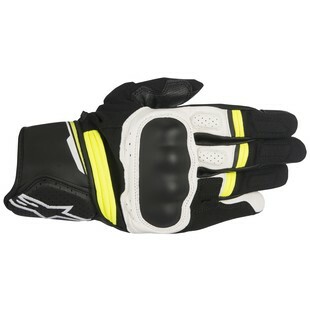 The new Alpinestars Booster Gloves are a racy new short cuff edition to the Alpinestars' line. Coming in three different colors, they offer no-frills protection with a touch of style. They offer a premium full-grain leather palm to keep your mitts safe in a worst case scenario, as well as a molded knuckle protector to keep both sides covered. The palm, thumb, and fingers are padded with a soft EPA foam to disperse impact, as well as a pinky side wall reinforcement. The pre-formed fit of the glove keeps you comfortable on the bike, and the touchscreen compatible forefinger and thumb means that you won't have to be pulling them on and off every time you need to update your directions or crank up the volume. Overall, the Booster is a wallet friendly CE rated glove that will keep you looking good, keeping cool, and staying safe.